Line 8x4-inch loaf pan with plastic wrap, leaving edges hanging over sides of pan. In medium bowl, mix yogurt and whipped topping. Spoon yogurt mixture into pan about halfway up sides of pan. Arrange wafer cookies vertically across pan, making 4 rows of 9-10 cookies per row, filling length of pan. Spoon remaining yogurt mixture over cookies. Cover top with plastic wrap. Freeze 4 to 8 hours. When ready to serve, dip bottom half of pan into hot water about 1 minute to loosen yogurt mixture. Use plastic wrap to lift torte from pan. 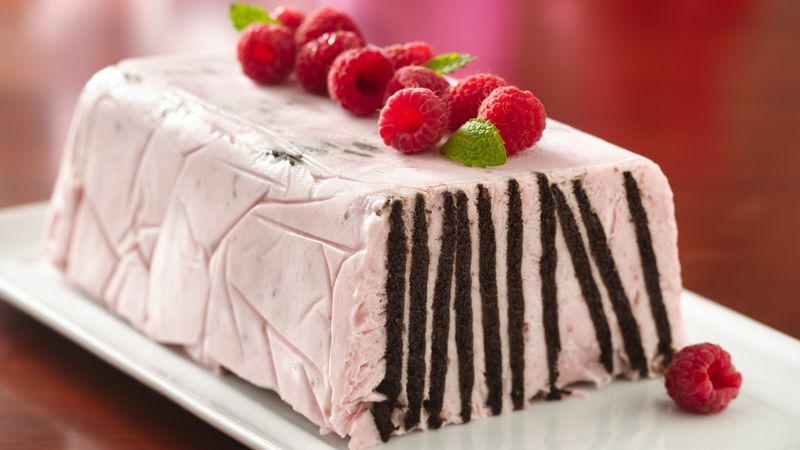 Garnish with fresh raspberries and mint leaves, if desired. Cut into 14 diagonal slices. Serve immediately.